“The Fire & Ice Series is a study in dichotomy, in that everything must belong to one part or the other, and nothing can belong simultaneously to both parts. The glass supports the steel and the steel supports the glass, one fragile, one not - but both parts unified. 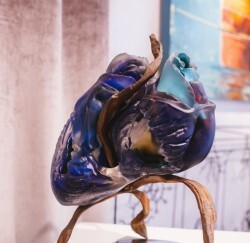 The sculptural element is often compared to the heart; I see that visually, but what I experience in the creation of each of these pieces is also very similar to the heart - there is a vulnerability to the glass, and as a bark protects a tree, the steel structure protects the glass. I am reminded of how we, as humans, create a protective barrier for our own hearts, and much like the sandblasted surface of the glass, with the soft edges similar to a sea pebble worn smooth by tumbling through the ocean, our own hearts are weathered, and tumbled, yet still beautiful and strong. I have my BFA in ceramics and my MFA in glass from Southern Illinois University. I started blowing glass at Penland School of crafts in 1978. The art I create has been a life-long quest. 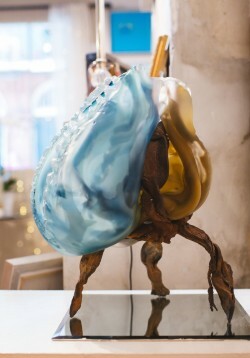 I am influenced by many different medias; glass, metal, wood and ceramics. I am amazed the influence these materials have on my artistic direction. My artistic views have also been shaped by some of the artists I have worked for; Harvey Littleton, Fritz Driesbach, and Brent Kington. 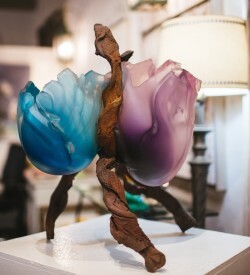 Morrissey is also one of the founders of Jackalope Glass Studios.